Thousands of people went to the Mount of Olives Tuesday on the 77th year since the death of Rabbi Avraham Yitzchak HaCohen. 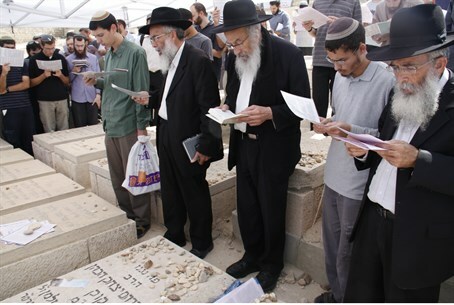 Thousands of people went to the cemetery on the Mount of Olives in Jerusalem Tuesday morning to offer memorial prayers at the tomb of Rabbi Avraham Yitzchak Hacohen Kook on the 77th anniversary of his passing. A conference on the ways and teaching of the first Ashkenazic chief rabbi of the Land of Israel during the British Mandate, and founder of Jerusalem's Mercaz HaRav flagship religious Zionist yeshiva, is scheduled to continue until 6:00 p.m. at the rabbi's home on Rav Kook Street in downtown Jerusalem.